If you own a swimming pool, then you undoubtedly know how much fun it can be to have this wonderful feature at your home. Rather than piling into a car and cramming into the local public pool, having your own swimming pool means you have the space to yourself and that you can utilize it any time that you want. Here at Universal Pool Service, we offer a vast array of pool services in Glendale, Litchfield Park, and Goodyear to ensure that your pool is ready to be used. Not only is owning a swimming pool a lot of fun, but it is also a way that you can keep yourself and your family healthy. You might not have bought a house with a pool or invested in a pool build because of your health, but you can definitely use your swimming pool to promote a healthier lifestyle. Whether you are hoping to shed a few pounds this summer or you just want to focus on balanced living, check out these tips for how you can use your pool to stay healthy. One of the most obvious ways to use your pool to stay healthy is to start implementing an exercise routine in the water. If you have a big enough swimming pool, then doing laps is a great choice. For the average person, swimming laps quickly for one hour can burn up to 600 calories! That’s an incredible number when compared to most workouts. Not only that, but swimming laps is a low impact exercise. This means that it won’t damage your joints and is ideal for those who suffer from knee problems. If your swimming pool isn’t ideal for laps, you can still use the water to exercise. There are an array of simple exercises that can be done in the water. The water adds extra resistance, which makes the workouts more effective than on land. For example, you can tread water to burn calories. On average you will burn anywhere between 300 and 600 calories treading water, depending on the intensity of the workout. Start your day off with a quick workout in your swimming pool. This is a great way to implement exercise into your life without a visit to the gym. Stress is a major contributor to a variety of illnesses. The less time you spend relaxing and the more your stress builds, the higher the risk to your health and well-being. It can be difficult to carve out time for yourself, but self-care is a must if you want to live a long and healthy life. This is another way that your swimming pool can help. Spend some time each day relaxing in the cool waters. Whether you simply float in the pool on your back or you gently swim through the water, focus on spending some quality quiet time each day in your pool. This can help you lower your stress levels and improve your health. For many, the best time of day to do this is during the morning hours when no one else is around to interrupt you. If you enjoy meditation, you can start doing your meditation in your pool. You can also use the area around the water for yoga or other calming activities. Vitamin D is an extremely important vitamin for your health. However, it is not a vitamin you can simply find in your food. Outside of foods that are fortified with vitamin D, such as milk, this vitamin can only be found in supplements or the natural way — by spending time in the sun. 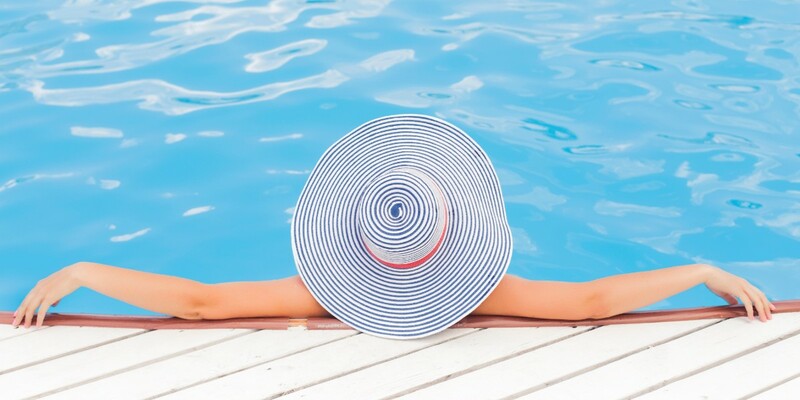 Soaking up the sun by your swimming pool is a great way to ensure you are getting enough vitamin D. While spending time outside is an excellent way to contribute to your health, be sure that you are protecting your skin and eyes. Wear ample sunblock and avoid being outside during the peak hours of the day. While vitamin D is good, skin damage is not. Studies have proven over and over again that socialization is key for the mental and physical well-being of humans. Without enough time spent engaging in meaningful ways with others, our health will decline. You can use your pool as a wonderful place to gather with family and friends. Invite people over each week to share in the joy of your swimming pool. This will allow others to reap the health benefits of your pool as well as provide you with a great opportunity for engaging with those you love. Ample socialization goes a long way in keeping your mind sharp and your body healthy. Finally, your pool is a great way to help encourage the whole family to be healthy. When your family members are healthy, you are more likely to stay healthy as well. Encourage everyone to utilize the pool for daily exercise. If you have kids, this will be easy! Kids naturally love swimming and playing in the water, which is a great way for them to stay physically fit. Spend time together relaxing by the pool to lower stress. Remember, no matter how busy your life is, caring for you and your family’s health should always be a top priority. If you plan to use your pool this year to help contribute to your well-being, we invite you to contact us to schedule routine pool services in Glendale, Litchfield Park, and Goodyear. We will work with you to maintain your pool and to keep it clean. Contact us today.